Sandy Views is the perfect family bach, located right across the road from the fabulous Oneroa Beach. With a large deck at the front, this is the ideal place for a beach holiday. The large open plan living and dining area opens onto the deck and has great views across the bay. Clever planting means you are private, and the is plenty of room to relax with a book on the deck. The dining area opens into the kitchen, and through there to the back door and laundry. Down the hall are three queen bedrooms and one bathroom. The sleep-out is separate to the main house and has a living area, one bedroom and a small ensuite. Perfect for a bit of space, or for teenagers to hang out. Wake each morning to the relaxing sound of waves just meters away, then wander up the hill to get the morning coffee. The proximity to the beach and the village means you never have to venture far! But if you do want to explore further afield you are minutes away from fabulous wineries! Note: due to a drop off the deck this is not suitable for toddlers. Note: the property is not to be used for any parties or gatherings. Each stay incurs a $200 charge for quality linen, towels and exit clean so you have nothing to do but relax, refresh and enjoy. 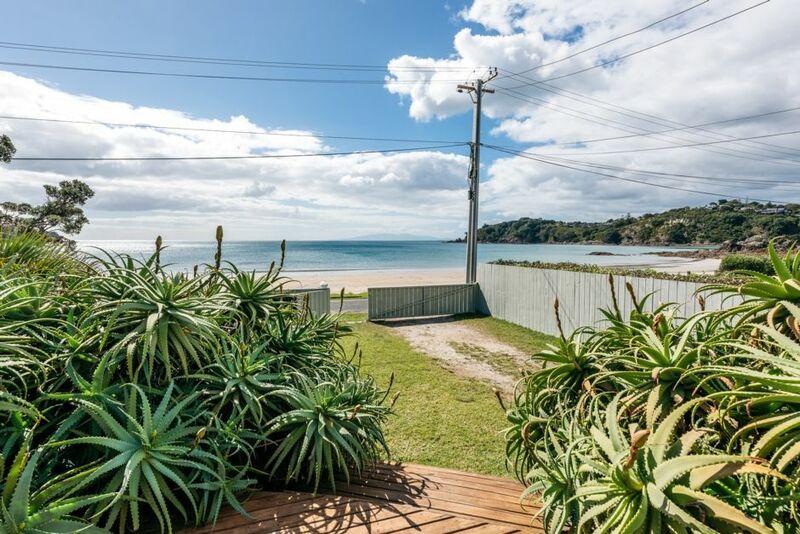 A fabulous bach right on the beach at Oneroa, with a large deck & a is the perfect spot for a beach holiday! Wake each morning to the relaxing sound of waves just meters away, then wander up the hill to get the morning coffee. Across the road from the beach! This gorgeous property is located in Oneroa, the main township on Waiheke Island.